Do you remember Chicken Little? The fried chicken spot in Highland Park, back in the day? Just so you know, this recipe ain’t know Chicken Little, that’s for sure! I’m sure you love a good piece of fried chicken now and then, but it’s not something you want or needs to eat on a regular basis. 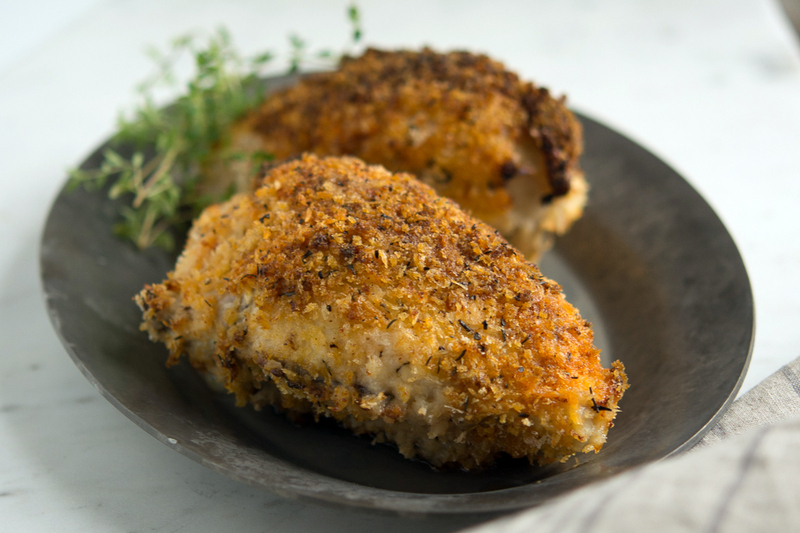 This Oven-Fried Chicken recipe is so easy, so tasty and pretty much guilt-free. You won’t need to pull out the fryer every time you want some delicious chicken. quick and easy, you’ll be beach-bound in a flash! If you keep the helpful tips in mind (see the notes in the recipe), and you will have successful results every time. Be sure to use a good hot sauce with the buttermilk marinade (one of my favorites is from Double Take Salsa Co., a local operation, and it’s delicious!) I like to serve my chicken with a yummy green salad, like the Lemony Brown Rice Salad. Both will go really well with your picnic! Be sure you use any leftovers in some Tortilla Soup too! Bonus! It’s like the old Shake ‘n Bake commercial (remember that one? ‘And I halped!’), only better! Remove the skin if you prefer, the panko makes a nice crusty coating, with or without skin. 1+ teaspoon hot sauce such as Double Take Salsa Co.
Whisk buttermilk, garlic, and hot sauce in a shallow glass dish or bowl until well blended. Add chicken and turn to coat. Cover and let marinate in the refrigerator for at least an hour or up to 24 hours. Preheat the oven to 425 degrees. Line a baking sheet with foil or parchment paper. Set a wire rack on the baking sheet and coat it with cooking spray. Mix panko, sesame seeds, paprika, thyme, baking powder, salt, and pepper in a paper bag or large sealable plastic bag. Shaking off excess buttermilk marinade, place one or two pieces of chicken at a time in the bag and shake to coat. Shake off excess flour and place chicken on the prepared rack. (Toss out any remaining flour mixture and marinade.) Drizzle the chicken pieces with the olive oil. 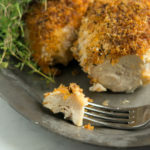 Bake the chicken until golden brown and no longer pink in the center, 40 to 45 minutes. An instant-read thermometer should register 165 degrees. The chicken will come up to 170 degrees (carry-over cooking) once removed from the oven. That’s right where you want it. Buttermilk is a natural tenderizer. It also lets you bread the chicken without the extra messy steps of the flour and egg dredge situation. If you don’t have buttermilk, add some lemon juice to milk, viola, buttermilk! 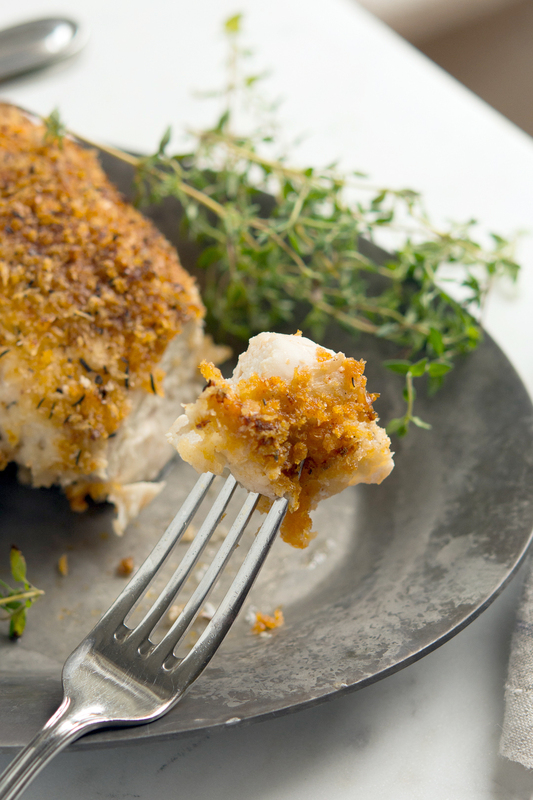 Adding the baking powder to the breadcrumbs will help the chicken brown. Sounds strange, but it works! Use any chicken parts you like. My family prefers breast meat, and in hindsight would probably cut them in half, but they still turned out great! One key is to liberally season the chicken and the breading, that turns out the best chicken! Bone-in chicken will give you the best flavor. It will also take a bit longer to cook, I recommend an instant-read thermometer, you won’t regret your purchase. Hi Shelagh, it’s Mary Rose Turner…I made this tonight. Kids loved it. Quick question….It says to cut the chicken breast in half. Do you mean slice them in half from top to bottom or cut them in half down middle of chicken? 3 pounds of chicken breast was actually 5 chicken breast (I even weight them to be exact!!). So in the end I really had 10 chicken breast. Is that right. I took a picture, wish I could attach it here but I don’t think I can. And as so for the rack I just used the rack I use to cool cookies. Is that right? As you can tell I do not have much experience with cooking but trying to cook more. 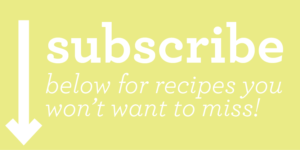 FYI…I love how the Pioneer Women posts lots of pictures of what each step should look like. Helpful for the dummies!!! Hope all is well, love your website and recipes! !